Big title matches headline New Japan’s Sakura Genesis PPV late tonight, streaming live on New Japan World from Sumo Hall. The show will feature English commentary, with Kevin Kelly and Don Callis calling the action. 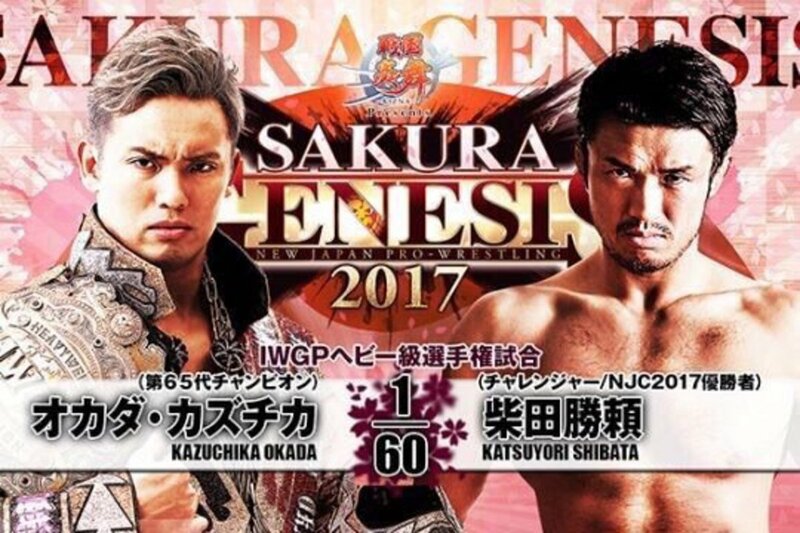 2017 New Japan Cup winner Katsuyori Shibata challenges IWGP Heavyweight Champion Kazuchika Okada in the main event. Aside from a G1 bout from 2013, they have been kept largely apart, which should make it an intriguing bout. In the co-main event, we have a Wrestle Kingdom rematch as IWGP Junior Heavyweight Champion Hiromu Takahashi defends against KUSHIDA. Hirooki Goto will defend the NEVER title against Zack Sabre Jr, Tencozy defends their IWGP tag team titles against ROH’s War Machine, and Suzuki-gun comrades Taichi & Yoshinobu Kanemaru defend against Jado & Gedo. The elusive Tiger Mask W will also make an appearance, teaming with Tiger Mask IV, Togi Makabe & Yuji Nagata to square off against Chase Owens, Tama Tonga, Tanga Roa & Yujiro Takahashi. Join us for live coverage starting at 2:40 a.m. EST/11:40 p.m. PST. Young lions jumped their opponents at the bell. Oka and Kitamura put Finlay and Nakanishi in stereo torture racks. Good opener, showcased all the young lions pretty fairly. Kawato looked the most solid out of the three, but Oka and Kitamura will go far if they continue to improve, if only for their size. Finlay came in and hit the diving stunner on Kitamura for the win. Kawato shoves around Liger after the match, continuing what seems to be a feud of sorts between the two. Standard tag team match which built up to a Tiger Mask W save. He wiped out his opponents on the outside with the Golden Triangle moonsault. Tiger Mask looks to go for the finish, but Owens distracts him long enough to walk right into a gun stun by Tama Tonga for the win. Suzuki jumps YOSHI-HASHI as he poses during his intro, which led to a lot of the match having him be the center of the match. This was fine, but kinda short and never felt super hot or anything. YH fought off against Suzuki and ended up getting the win with Karma on Taka Michinoku for the win. Gedo & Jado started things early as they took down the faces with dual crossfaces but got their comeuppance on the outside. Kanemaru took out Gedo with a legdrop on top of the barricade and Jado was jumped after a distraction by Taichi’s valet. Jado made the hot tag and after putting Kanemaru in the crossface nearly had it won, but Desperado pulled the referee out and freely ran in to interfere. Roppongi Vice came in for the save and wiped it out Desperado. Everybody got in at one point, with the finale being Taichi hitting Jado in the throat with the microphone stand. He blasted Jado with the superkick and Kanemaru followed with the moonsault, but Jado kicked out. Finally Kanemaru drilled Jado with the DDT off the top rope for the win. Subpar by New Japan title match standards, these four guys don’t mix together well style wise and most of it was ref bumps, brawling and setting up for the future title match. Roppongi Vice came back in after the match and argued Taichi’s use over the ring bell hammer. Taichi shrugged. They challenged for the junior tag team titles, setting up the next title program. Pretty solid match. A lot of the early stuff was Yano comedy, undoing the turnbuckles and the like. Omega and Ishii worked together until Yano low blowed Omega while he was going for the One Winged Angel. Omega rallied back after he whipped Ishii into one of the exposed turnbuckles, hit a few knee strikes then defeated Ishii with the One Winged Angel. I liked this match, probably the best out of the tag matches tonight. Lots of good back and forth action. Naito went for the Destino on Robinson but Tanahashi wiped him out with the slingblade. Everyone came in for a bit of offense before it came back down to Naito and Robinson. Naito lifted him up and went for a swift kick to the netheregions but Robinson grabbed his leg, hit Naito with a big punch and pinned him with the Pulp Friction for the biggest win of his career. Robinson called out Naito after the match, straight up challenging him to a match for the Intercontinental title. Rowe and Hanson work over Kojima a good while before finally Kojima gets an opening and tags in Tenzan who cleans house on Rowe. Rowe went to do a double press slam on both Kojima and Tenzan but they countered and laid him out, then moved when Hanson went for a splash, hitting his partner in the process. Hanson mounted a comeback but missed a moonsault and ate a cutter. Rowe is tagged in as Hanson hits an assisted pop up powerslam as Rowe covers for a nearfall. Hanson wiped out Tenzan on the outside with a suicide dive. Kojima started to rally and came back with a giant lariat that bent Rowe in half. Kojima went for a second lairat but Rowe countered with a German and a knee strike. Hanson launched off the top rope as they hit Fallout to win the IWGP tag team titles in a really good back and forth match. Tenzan came up to the new champions after the match, saying they wanted one more match. Hanson and Rowe agreed as they shook hands with their opponents and bowed. I thought this was a pretty good match, not great but very well worked one and Sabre’s offense is so great. Afters some back and forth to start, Sabre gains advantage and focuses on the arm, wrenching the fingers, then takes apart one of Goto’s legs. He twists and torques the body parts in all sorts of painful ways. Goto gets a brief flurry of offense but Sabre transitions into a guillotine, trying to kimura the arm. Goto counters with a suplex. Goto went for an elbow, but Sabre grabs one arm, then both and torks one shoulder until Goto gets to the ropes. Sabre continued to wrench until Goto hit the ushigiroshi. Desperado comes in to distrct Goto, leaving him open to be jumped by Suzuki. Goto fights them off, but again is open to Sabre making a comeback. He goes for a gogoplata but Goto lifts him up and hits a one armed powerbomb. He follows with the GTR to retain the title. Goto raises the title after the match in front of Suzuki. He didn’t take too kindly to that, making a beeline towards Goto and starting a pull apart brawl. Needless to say, we have a new NEVER title program. This didn't even get two mintues. KUSHIDA came out flying with a tope con hilo off the top rope to the floor, wiping out Takahashi. KUSHIDA is on the apron when Takahashi counters with a giant sunset flip bomb to the floor. Takahashi takes him inside, hits a running death valley driver into the turnbuckle then pins KUSHIDA with the time bomb just like that. For such a short match, this was pretty fast paced with some crazy moves. Kinda surprising the co-main was so short, but I’m probably thinking this is just a storyline for KUSHIDA as he enters the Best of the Super Juniors next month. Takahashi berates KUSHIDA after the match, posing with the title and eating his wrist tape with a watch drawn on. He continues to beat upon KUSHIDA’s prone body until Ricochet runs in to make the save. He grabs a mic, saying it’s time for the belt to go where it should have gone a long time ago, around his waist. Takahashi slithers away, not really ready to answer. This was an incredible match, I think even exceeding Okada/Omega from the Tokyo Dome earlier this year. As far as intensity goes, this had the most out of anything I’ve seen in a long time. Just stiff, brutal shots and incredible psychology and storytelling. This is one of those matches that you need to go out of your way and see because it’s that good -- everything just felt like it was on point and couldn’t be executed any better. Shibata outwrestled Okada early, sending him to the outside. Okada doesn’t do a clean break and they’re off, striking one another with hard shots. Shibata grinds Okada back down, focusing on the knee but Okada strikes back by crotching Shibata, then sending him down to the floor with a dropkick. Shibata starts to absorb punches until he strikes back with one that sends him to his knees. He pelts Okada with punches, sending him to the floor and drilling him with a dropkick, then does it again with the barricade on the outside. Okada makes a comeback, doing the rainmaker pose and going for the rainmaker but Shibata counters with an STO. Incredible striking follows. Every strike in this match so far has been on point, in fact. Okada goes for a pin but Shibata grabbed an arm and wrenches it in with an armbar. Okada escapes as they get into another scary slap battle. Okada manages to get Shibata into the corner and hits a running dropkick. Shibata follows with a dropkick, similar to Okada’s. He goes for the penalty kick but Okada follows with a dropkick. They get back up and start trading some insane offense, including Shibata dropping Okada right on his neck with a German. Okada goes for the rainmaker but Shibata peppers him with kicks. Okada manages to hit it anyway, but Shibata no sells it and hits a giant headbutt, splitting himself open in the process. Gruesome. After a long abdominal stretch, Shibata kicks Okada in the chest and goes for the sleeper. Okada fights it, getting to his feet, but falling to the floor. He gets back up, but Shibata drills him with a half nelson suplex. He motions like he’s going for the rainmaker but instead slaps him and just DRILLS him with kicks. He goes to whip Okada but he retaliates with the rainmaker. Maintaining wrist control, Shibata tries to fight back but knows he’s in trouble. Shibata lifts his arm like he is going to block the rainmaker but Okada gets it anyway and pins him to retain the title. Incredible. Okada prepares to celebrate with the title when Bad Luck Fale ran in and beat him down. He said a bad word on the mic then laid him out with the Bad Luck Fall. Yep, he challenged Okada. Kind of weird as they didn’t even telegraph it with the booking tonight, but I guess we can just go to this well again for a while.